For years, we’ve had a swing in our backyard. With the big kid, we only needed one, and we have the perfect tree, so the baby swing was eventually replaced by a belt swing, and she has always, always loved it. Then the baby came, last spring, and suddenly we find ourselves in a conundrum — no place for a baby swing! To that end, we are looking to build a swingset. There are lots to choose from! If you are looking for high-end, look no further than the Maine-made Cedarworks sets. I don’t even dare have their page open with my big kid in the same room, for fear of setting an unreasonably high expectation. You can play on a set at their headquarters in Rockport, at 799 Commercial Street. Another high-end (though not made in Maine) company is Rainbow Play Systems. They have many configurations, and their nearest dealer is in Portland. It’s not hard to be excited about the possibilities of a luxe playset, but it can be hard to afford one. The big box stores sell basic playsets, from simple plastic sets (great for portability if you know a move is in your future, or for resale! ), to classic metal sets, to wooden sets that are not quite as luxurious as the custom companies. Lowe’s and Home Depot also sell components for the DIY-ers — and that’s likely where we will be landing. You can search for swing set plans online, and find all kinds of ideas, but I’m hoping the more experienced families might have some input on what would be in the ultimate budget DIY swingset for their kids. 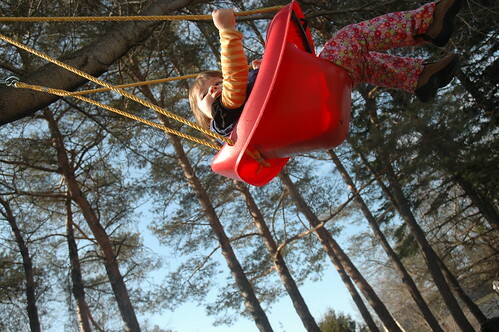 What do you love about your swingset? What do your kids play with the most? My baby turned one year this week(! ), so I thought I’d share my top ten list of things that make life easier for us. Babywearing — a wrap, or pouch, or soft structured carrier — there are many, many ways to wear your baby. Our family prefers to not use the ubiquitous infant ‘bucket’ seat, and babywearing makes it possible. For a little baby, a fleece pouch or a stretchy wrap (you can buy the Sleepy Wrap locally) is great, and as my kids get bigger, I prefer a woven wrap and my husband prefers a soft structured carrier. Wearing the baby means we’ve been able to take the kids where strollers can’t go, it’s made air travel a (relative) breeze, and it’s a guaranteed cozy place for a nap when out and about. 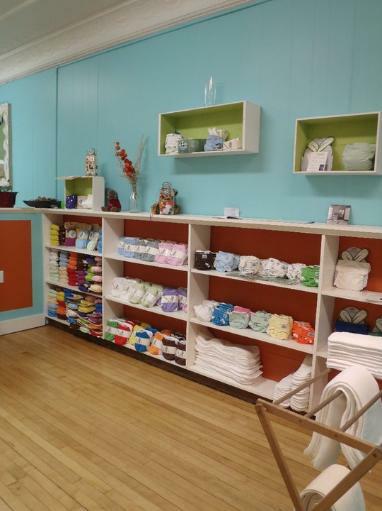 If you want to learn about your babywearing options, visit Central Street Farmhouse — they are well versed in the many ways to carry the little one. Baby Leg Warmers : I have these from multiple sources, and these are also a staple in a shower gift for me. They cover the gap between pant leg and sock in the best way (especially in a Maine winter, when that gap can get chilly, quick!) and they make the best ‘tights’ for my daughters when they are in dresses — no wrestling actual tights on between diaper changes, and honestly, they are usually cuter than true tights. For both boys and girls, they function like a long john layer, again, without having to deal with that layer with diaper changes. Central Street Farmhouse has some adorable styles, for less than $10 a pair. Simple Wishes pumping bra: I work full time, and I breastfeed, which means that I pump. Pumping is never glamorous, and generally not enjoyable, but the Simple Wishes bra makes it so much easier. With my first, I never had a pumping bra because I didn’t want to roll the dice on choosing the wrong size, so I just made do without. With this baby, I went back to work earlier, and the Simple Wishes bra took the size quandary out of the equation — there are two sizes, and then those sizes are infinitely adjustable, so as you lose the baby weight you can adjust the band to accomodate that. It holds both flanges in place, solidly, and allows me to still work on the computer as I pump. It’s still not glamorous, but it is key to making it less onerous for me. You can also find those at Central Street Farmhouse. iPod touch : I am a professional geek, anyway, and have a laptop, an iPad, a Kindle, etc, but hands down, the iPod touch is my must-have tech gadget for a mom. When I was pregnant, I used it to track everything from my doctor’s appointments to my glucose numbers (I had gestational diabetes) to my contractions. I tweeted my labor to keep phone calls at bay, but still keep family and friends updated. I tracked early nursing sessions using an app, to remember which side I’d last used, and I read books on the Kindle app during late night nursing sessions in the dark. And now, the new models have a camera that takes (low-res) stills and shoots HD video! The ideal gadget for the mama who is going to have one arm occupied for hours at a time, or end up pinned under a sleeping baby but in desperate need of a glass of water — just email daddy! In celebration of the baby’s first birthday, I actually upgraded to the iPhone4. It’s pretty cool. 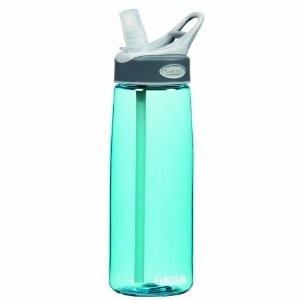 CamelBak water bottle: If you are nursing, you need water. All the time. (And if you aren’t nursing, you need water all the time, too, but I think breastfeeding mothers experience a thirst that is unlike other thirsts.) The Camelbak with a bitevalve is the best water bottle to use, hands down. 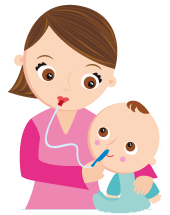 I could wedge that between me and the couch cushion and drink hands-free while nursing the little one, because it doesn’t require you to tip it back to get water. They make it in several sizes, and the bitevalve is easy for a little kid to figure out, so if you are out hiking, etc, and they need water, they aren’t going to dump the entire bottle down their shirt trying to sip out of one of those old-school Nalgene bottles (whose caps ALWAYS hit me in the face, which is also not a feature of the Camelbak.) They come in cute colors, and a cleaning tip — disassemble the straw, bite valve, moving parts, etc, and drop those into the bottle with a denture cleaning tablet and follow the directions of the denture cleaner. Great trick to clean fiddly things like Camelbaks and travel mugs and sippy cups! Roku : We don’t have cable, but we do have a Roku, and it is the best way to watch tv, ever. I swear. With a Roku (models range from $60-$100, depending on features) you can stream from your Netflix Instant queue, in HD, to your tv. The content has grown by leaps and bounds over the two years that we’ve had our box, and for our older kiddo, it’s nice to have television that she likes (Dora, Blue’s Clues, the impossibly whiny Caillou) without the ads that cable likes. With a brand new baby, it was great to curl up and watch movies while the little one nursed the day away, without having to go to a Redbox or, you know, pay for cable. (Our Netflix account is less than $10 a month.) In addition to Netflix streaming, a Roku can access Hulu+, Amazon Video on Demand, Pandora, and a whole slew of private channels. 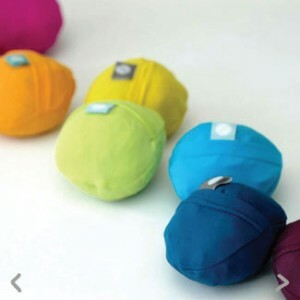 Flip & Tumble bags: These little bags roll up into a ball when you aren’t using them, and when you get to daycare and have a pile of art projects, lunch leftovers, a hat that was left behind a week ago, and all the OTHER things kids pile up at daycare, it pops out to a full (or mini) shopping bag. I always have a 24/7 and a minibag in my bag or coat pocket at all times and they’ve been great. Mabels Labels: If you are a working mama, you know the need to label everything for childcare. Mabel’s Labels are stickers that will stick to just about anything, are dishwasher and microwave safe, but then peel off when you want them to. We buy packs of the Skinny-Minis, as they fit perfectly on the bottle parts at daycare, and our daycare providers have loved them just as much as we have! Once they move past bottle stage, we use them to label books that are hauled into preschool from home, backpacks, lunchboxes, food containers, you name it. We love them! Amazon Mom : I do a lot of shopping at Amazon, and the Amazon Mom program offers a free trial of their Prime membership, that can be extended based on what you buy from their baby section. I have a diaper subscription through Amazon Mom, and that earned me a full year of free Prime. Being able to have stuff shipped directly to me, and quickly, is amazing. There’s my top ten! What are you must-haves for that first year? Raising Maine — this is a free publication that is heavily geared towards Southern Maine families, but they won’t reject your subscription if you live north of Brunswick. They have a twitter feed, too, and it’s not so bad to have ideas on stuff to do in southern Maine for those random day trips. In this month’s issue, the farewell column by Raye Tibbitts really made an impression on me, and is basically the advice I’d give any new mom, myself. One Mom in Maine — this is a blog written by a nearby mom that focuses on family and fitness, with lots of love for our area evident throughout. And it’s kind of heartening to know that the beautiful meals she cooks aren’t always savored by her kids, you know? Real. Bangor Metro — I love the magazine, and if you can’t get it in hand, the flipbook is a great way to see the current issue. And a column from The Globe and Mail that was well-timed for this working mama: Ditch the guilt, working moms: The kids are all right. What have you been reading this summer? I’ll be posting about the actual books I’ve read recently, soon. I shouldn’t be surprised, really, that it’s been three weeks, but it’s been three weeks? Really? I returned to work after my maternity leave, and juggling work, a preschooler and a newborn, and trying to enjoy our Maine summer (and this one has been a beauty!) posting came in last. Honestly, I should probably be folding laundry right now, so let’s say it came in second to last. I am still here, though, and always taking suggestions or tips on stuff that’s going on in our fair city (and beyond), just currently working to get my sealegs under me. I have another post cooking already. It’s the first day of summer! Today, the other Bangor pool opened (Dakin, on Pine street) following the opening of the Pancoe pool on Saturday. I have to confess, though, that while people here in Bangor were facing the muggy day at the awesome Pancoe pool, we were out of town, swimming in the lake of my childhood. There really isn’t much that’s better than a crisp, cool lake on a hot muggy day, and seeing your own kid doing all the things you once did growing up — jumping off the same docks, preferring the same entry points, digging the same trenches to the waterline — is pretty cool. We’ll certainly make it to Pancoe more than a few times this summer (we live just a few blocks away, so we don’t even need to deal with parking!) but I will always cherish the lake days. Of course, my lake is a hundred miles away, which is two hours of “are we there yet?” and I Spy and kids’ music in the CD player, and that has it’s own…. merits, but I know that closer to town there are good options, too. We’ve been to Peaks-Kenny, in Dover, but generally we make the drive or go to the pool What are your favorite swimming holes in the Greater Bangor area?